LEARNING CURVE ACAD alum and new teacher Krystal Boone (left) shares a laugh with students. Just five years ago, Krystal Boone didn’t know what her future held. As a new graduate of the Academy of Construction & Design that year, Boone was focusing on going off to college, where she planned to study business. But it had at times been a difficult road to get to this point in her life. When she started at Cardozo Senior High School in 2008, it wasn’t where she wanted to be. So, she “acted out” – roaming the halls and skipping classes. That all changed when she discovered the Academy, where motivation and support from staff helped her believe in herself, stay in school and pursue a college degree. The Academy taught me skills morevaluable and important than safety and carpentry – it taught me to value my education, and not to let it go to waste,” she said at the time. Now, Boone is working as a teacher at the Academy she graduated from in 2010, and sharing those same values and giving support to future generations of students. For students facing academic challenges, she is “constantly trying to motivate” them to “keep up morale and stay in school,” encouraging them not to give up on themselves so they finish the year strong. “It’s a how-to-better-your-life focus to get them to make the right choices now instead of trying to correct all their bad choices junior, senior year,” said Boone of the class she now teaches to mostly ninth graders enrolled in ACAD, a program that blends core academics like math and science with hands-on training in skilled trades like carpentry and electrical. The program moved from Cardozo to IDEA Public Charter School at the start of the 2015- 2016 academic school year. As a new teacher for the “Intro to ACAD” class, Boone is responsible for more than 30 students across two classes. Her daily duties include tutoring students, taking the class on field trips to see the student-built micro-house, and of course, introducing students to the trades of carpentry, electrical, plumbing, HVAC (heating, ventilation and air conditioning) as well as the latest addition, architecture, already offered at IDEA. The hybrid class combines the NCCER (National Center for Construction Education and Research) core curriculum – a nationally accredited construction training program – with a Youth Farmer’s Market (see related story, page 3) curriculum specifically designed by the D.C. Students Construction Trade Foundation, which oversees the Academy. The NCCER curriculum introduces students to career pathways before students specialize in a skilled trade, receiving credentials upon graduation. CLASS TIME Krystal Boone teaches the basics of construction math to her students. 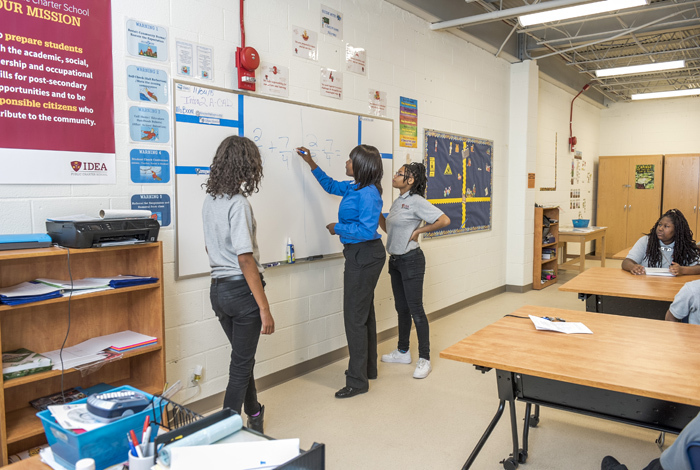 Under Boone’s direction, the class completes a series of “modules” – including introduction to construction math, basic employability skills, and on-the-job safety – that prepare students to pursue a specialty area of choice, starting in 10th grade. Classes are a mix of hands-on learning activities, question and answer sessions, performance tests, and book-based curriculum. Meanwhile, with the anticipated launch of the farmer’s market in spring 2016, students will be conducting community outreach at churches in the Deanwood neighborhood to inform them about the fresh food options that will be available through the market. And students are already learning about the cultivation of fresh fruits and vegetables – all to be grown on the school’s grounds. “They research what would actually grow in this area based on the weather,” explained Boone. “It’s a way for us to produce fresh fruits on our school property to give to the cafeteria to provide to our students, as well as to the community.” This effort, she continued, builds on the core values of the Academy to build bright futures – in this case, by students becoming stewards within the community and developing something new that helps the school and neighborhood. Unlike past years, Boone said girls are the majority in her classes. Out of 35 students, she estimates as many as 25 are girls. She credits the rise in skilled trades interest to knowledge. “It’s the competitiveness of knowing you can do something that is typically [considered] a man’s job,” said Boone, who studied carpentry and electrical in the Academy. She added that a recruitment effort last year likely increased parental interest in career pathway options for their kids. She said her female students shatter stereotypes of not wanting to get their hands dirty. Boone knows firsthand what a young woman can accomplish when she sets her mind to it. After graduating from the Academy, she attended Bennett College in North Carolina. She graduated in 2014 with a Bachelor of Arts and Science degree in interdisciplinary studies, combining early childhood education with arts and humanities. Following graduation, she revisited her educational roots: working for her mentor Shelly Karriem, director of the Academy. 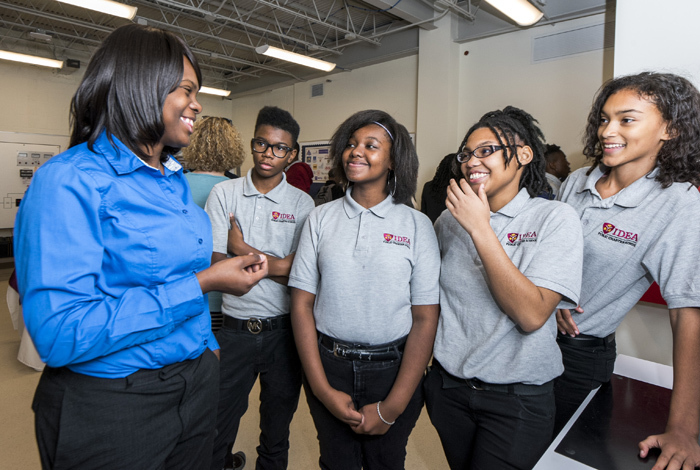 As Karriem’s assistant – a position she held from May 2014 to August 2015 – she helped students prepare for ACAD’s key programs, including the annual Meet the Future luncheon and bootcamp. She also carried out administrative tasks, such as maintaining the alumni database. All these responsibilities helped prep her for her latest role. And while Boone calls her own teaching style one of “tough love,” Karriem said her former student is still finding her way, finding that balance: “She’s more tough than love” – and still needs to soften up. From the start, it was certain Boone would move with the Academy to its new home at IDEA. Less clear, however, was what her position would be, according to Karriem. A teaching demonstration before IDEA and Academy leadership soon clarified Boone’s role. Together, they tapped her for a new, different job. Boone, 22, officially joined the IDEA staff as an Academy instructor. It seemed a good fit, added Beth Moore, who has known Boone since she was a student at the Academy of Construction & Design at Cardozo. In her new job, Boone transferred the organizational skills she used as an assistant to teaching. Now, she organizes lesson plans and meetings to discuss student progress. 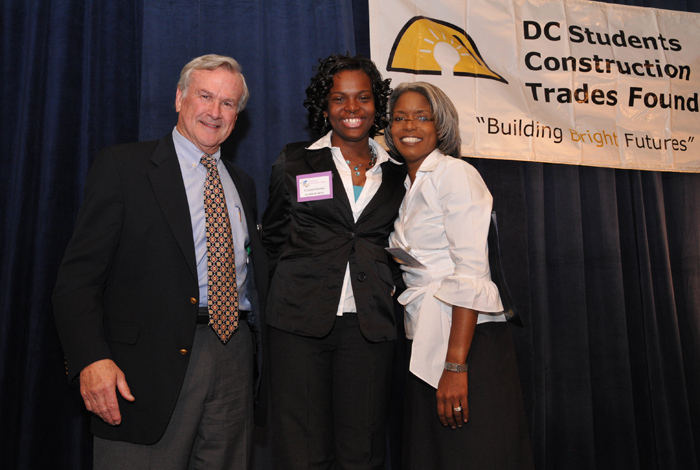 FLASHBACK Boone (center) with mentor Shelly Karriem (right) and D.C. Students Construction Trades Foundation President John McMahon during her 2010 graduation ceremony.